I’m Steve Gustafson and thanks for stopping by. Don’t forget to check out 411mania’s Comic Book Review Roundtable, every Thursday! Read up on the best reviews and let us know what you’re reading as well. Click to read the latest Comic Book Review Roundtable! What if? Flash Thompson Became Spider-Man #1, and more! Zeus: “As a kid, Vermin and The Brood from Marvel scared me the most. Mr.Greed: “Vermin is a great horror character, but sadly overlooked. His appearances in Last Hunt and Child Within captured both the tragic, and scary aspects of his character very well. Professor Pyg is one of the scariest villains I have ever seen. He acts like someone who is truly mentally ill and his scenes from batman and robin are truly disturbing. He is another underrated villain and I hope more writers use him in future stories. Anton Arcane makes Joker look tame. A mad scientist who was obsessed with immortality, Anton would become more twisted and evil, losing mote of his humanity in the process. His most vile act was when he took the form of a fly and possessed the body of his Niece’s husband. Afterwards, he psychologically tortured her and sent her spirit to hell. And won’t even mention what he did with her before the reveal. Halloween is almost upon us and as we continue are “scary” theme, what better way to get ready than talk about some of the scariest moments in comics? 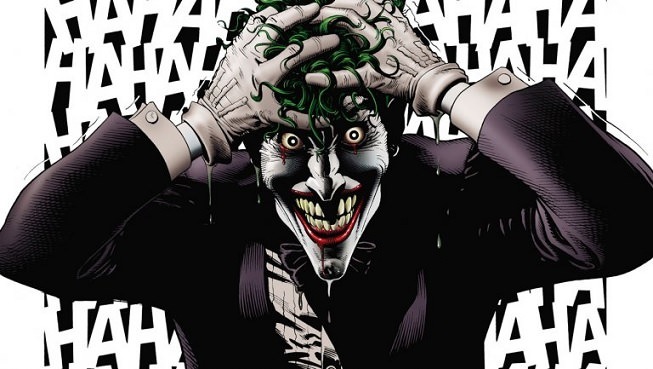 Let’s begin with a couple of moments from the creepiest guy in comic books…the Joker! We could include such moments like when he killed Robin in A Death in the Family. Shocking and brutal, it showed Joker in a sadistic light. Topping that has to be when the Joker terrorized, shot, and molested Barbara Gordon in The Killing Joke. I still remember reading it for the first time. Breaking into Jim Gordon’s home, the Joker beats him, then proceeds to shoot Barbara in the stomach, paralyzing her. It gets even worse as he strips her naked and take pictures of her suffering. Gut-wrenching. Of course I’m going to throw in when he cut off his own face and then wears it as a mask. Thinking about it, the Joker could have his own scariest moments Top 10 list. Batman’s not too shabby with his own creepy moments. One that stands out to me is the Batman & Dracula trilogy. The third, Crimson Mist, gave us a vampire Batman draining and decapitating all of his old enemies. A vampire Batman is not someone you want to cross. Neil Gaiman’s Sandman saga is another list by itself. To pick just one is almost impossible but I’ll throw the scene of Dr. Destiny going into a diner and uses his reality-bending powers to control the patrons there to become his deviant minions. Sadistic and disturbing. Add another Doctor to the list with Doctor Light. Identity Crisis showed us that Doctor Light had raped Sue Dibny, the wife of Elongated Man, on the JLA Satellite. It showed us a more dangerous Doctor Light and changed the way we view him forever. Where to begin with Kid Miracleman’s story and his London rampage? The sad, tragic tale of Johnny Bates is a must read for mature readers but the battle between Kid Marvelman and Marvelman, Marvelwoman, Firedrake, and the Warpsmiths with the ravaging of London and the horrific murdering of much of the city’s population will never leave you. Another scary and disturbing moment in comics can be found in the pages of League of Extraordinary Gentlemen between Mr. Hyde and the Invisible Man. The Invisible Man beats Miss Murray savagely and then is confronted by a true savage. Hyde grabs the Invisible Man and has his way with him, tearing him apart. Not for the faint of heart. Preacher has a number of disturbing scenes but early in the series run we meet Si Coltrane, an friend Cassidy’s, who is an investigative reporter ont the trail of the serial killer known as the Reaver-Cleaver. We first see the Reaver cut off a man’s face and then nail the removed skin mask upside down to the still living victim. A lasting impression that stands out among many. Another comic with a plethora of scary moments is The Walking Dead. I’ve lost count how many times I’ve held my breath while reading but nothing made me gasp louder than when Lori and the baby get shot and killed. Even Negan’s beating of Glenn didn’t get me as much as that moment. Pure horror. 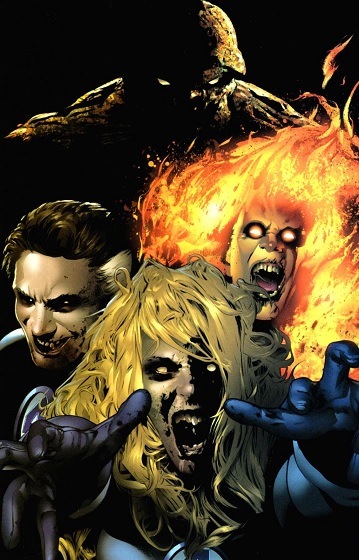 Another zombie moment comes from when we’re first introduced to the Marvel Zombies. In the pages of Ultimate Fantastic Four, Ultimate Reed Richards finds himself in a strange universe, one that appears to be the Silver Age 616. Except it’s not even close and when we first see the Marvel Zombies for the first time, it’s a jarring and creepy moment. One of my favorite horror comics is Steve Niles and Ben Templesmith’s vampire tale 30 Days of Night. In the second issue, head vampire Niles provides a poignant and dark moment when he states, “This is how it’s meant to be. Humans like bottles waiting for their caps to be popped.” The visuals accompanying this scene still linger with me. 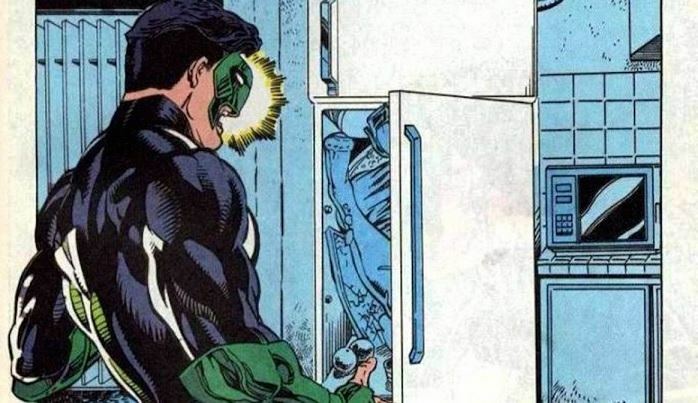 Wrapping up, back in the 1990s, Green Lantern Kyle Rayner gave the industry one of the most shocking and scary moments in mainstream comics when Rayner’s girlfriend Alex DeWitt was found murdered and stuffed in the fridge by the hands of Major Force. A shocking twist and horrrific moment. What are some of your scariest moments in comic books?